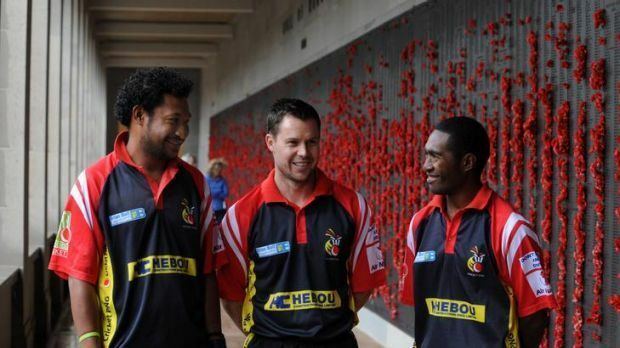 Assadollah "Assad" Vala (born 5 August 1987) is a Papua New Guinean cricketer. A left-handed batsman and off spin bowler, he has played for the Papua New Guinea national cricket team since 2005. Born in Papua New Guinea in 1987, Assad Vala first represented Papua New Guinea at Under-19 level, playing in the 2004 Under-19 World Cup in Bangladesh. He made his debut for the senior side at the 2005 ICC Trophy in Ireland, where he played his seven List A matches. He returned to Under-19 level later in the year, playing in the Africa/East Asia-Pacific Under-19 Championship at Willowmoore Park in Benoni, South Africa. In 2006, he played for a combined East Asia Pacific team in the Australian National Country Cricket Championship, an event he has repeated in 2007 and 2008. In 2007, he played in Division Three of the World Cricket League in Darwin and most recently represented his country at the 2007 South Pacific Games, where he won a gold medal in the cricket tournament. Since then, Assad has become the best batsman in the EAP region. He competed for PNG in the Division Two where he had an average tournament. But it was in the Division One tournament where he began to come of class. He was the leading run scorer with 372 runs in 6 games, making 2 fifties and a century (116 of 59 against Japan). He carried this into the Twenty20 Qualifier where he had a solid tournament top scoring with a well made 52 against Canada. Towards the end of 2012 Assad showed his true ability. Playing in the Bulls Masters T20 Qld Rail cup, for PNG, he made 2 eye catching 40's on the first day which in return had him selected by Brisbane Heat coaches to represent "the Infernos" in the 2012 t20 KFC challenge. During this tournament against quality opposition including several Qld bulls and Brisbane heat players he made 50 off 30 balls in the second game. In his last game he made 19 off 12 balls, which meant he was selected to train with the Brisbane Heat throughout the 2012–2013 big bash season. The confidence he got form receiving this opportunity clearly showed. Represent EAP at the 2013 Australian Cricket Country Championships he was 2nd on the leading run scoring list. Several stand out performances including 97 against QLD country and 100 not out in T20 against South Australia. At the end of the tournament Assad was selected to play for the Australian Country side in a T20 match against the QlD bulls invitational side where he was Man of the match for his 22 of 10 balls including hitting Australian fast bowler Ryan Harris for a six. In early February PNG played in the EAP division 1 tournament in Auckland. (which PNG won)Assad Again top the run scoring with 395 runs for the tournament including a massive 164 not out off 64 balls against Indonesia. He has stamped his name is the best batsman in Papua New Guinea and in the Associate and Affiliate world (EAP). Come 2013 Assad is referred to as the Chris Gayle of the pacific. Assad continued his rise among the cricketing world. He dominated in PNG's domestic competition "The Hebou Shield" and was leading run scorer in this comp. Playing for PNG in the Asia-Pacific Rising Stars T20 tournament in August he managed 175 runs with an average of 43.75. Top scoring against the Australian Combined Armed Services with 63* off 38 balls. Being Selected by QLD cricket in the "2013 KFC challenge" for the country infernos side he made 31 runs in the first round opening the batting. In the second round Assad again opened the batting and made a classy 50 off 38 balls including two 6s and six 4s.